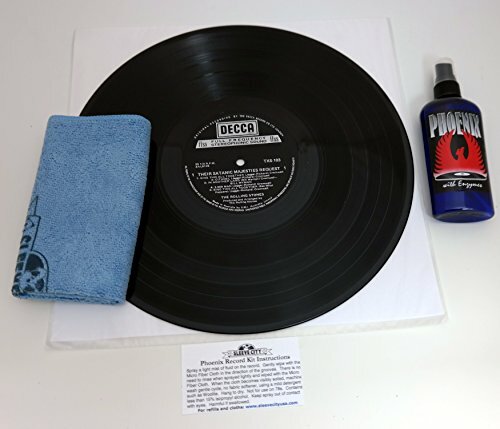 Our Phoenix Record Cleaning Kit includes a 4-ounce spray bottle of Phoenix Record Cleaner with enzymes along with a patented, reusable, microfiber cloth! The cloth alone may be used for dry wiping dusty LPs and is better than any record cleaning brush in picking up dust and lint. The Microfiber Cloth may be washed in a mild detergent, such as Woolite, rinsed thoroughly and air dried. We guarantee you'll love it. The kit includes 1 12 x 12 inch Microfiber Record Cleaning Cloth and 1 bottle of 4 oz. Phoenix Record Cleaning Spray. If you have any questions about this product by Sleeve City, contact us by completing and submitting the form below. If you are looking for a specif part number, please include it with your message.